I’ve been out of the kitchen for quite a while and I have seriously missed it. This lovely little recipe landed in my inbox from my favorite blog, The Simply Luxurious Life, and I was instantly inspired. I didn’t change a thing and it turned out absolutely delicious. 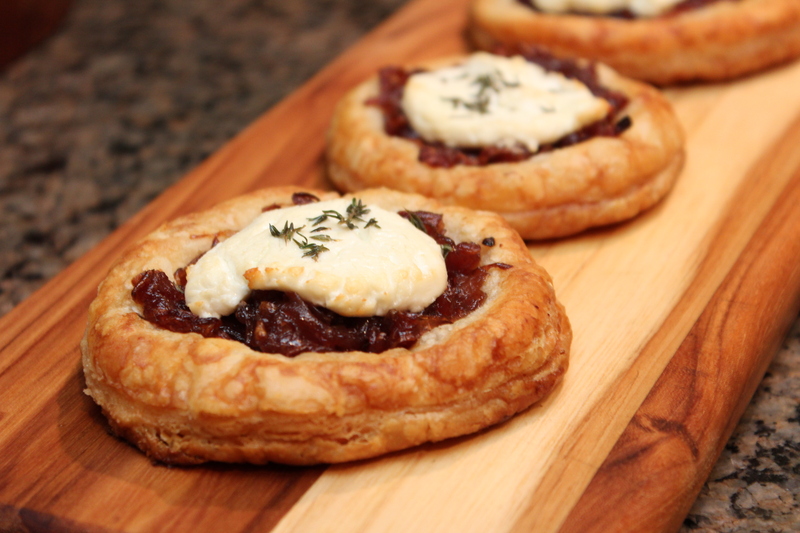 I’m obsessed with caramelized onions and the flavor of the wine soaked onions and thyme paired so beautifully with the tangy goat cheese and flaky puff pastry. 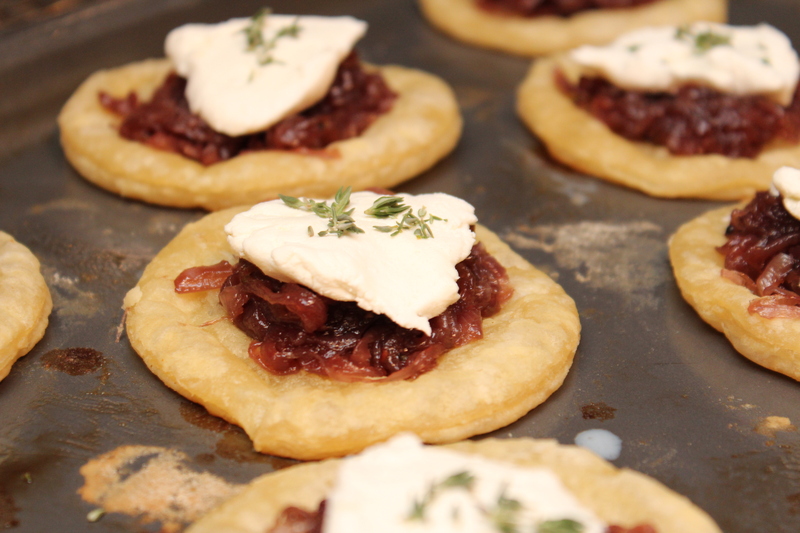 It’s the perfect appetizer or mid day snack. I ate one cold the day after and the flavors were so bold and scrumptious! 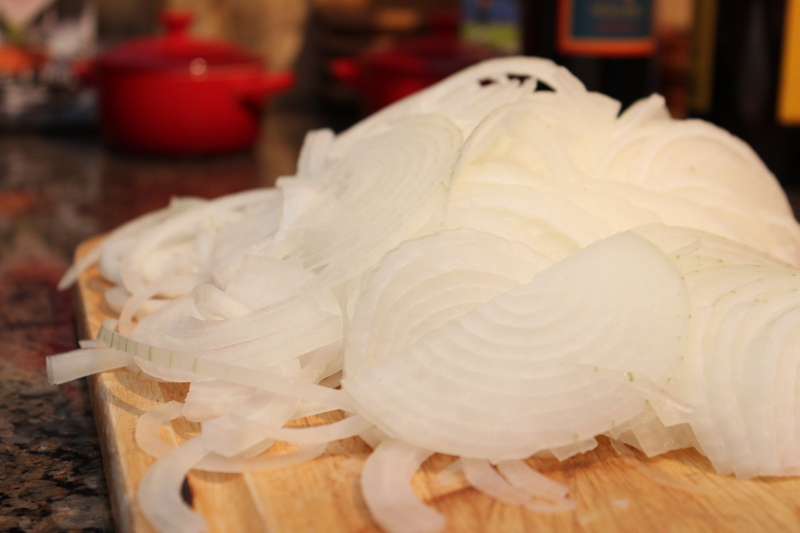 Heat the oil in a pan and fry the onions over a low heat until softened but not browned, about 15 minutes. 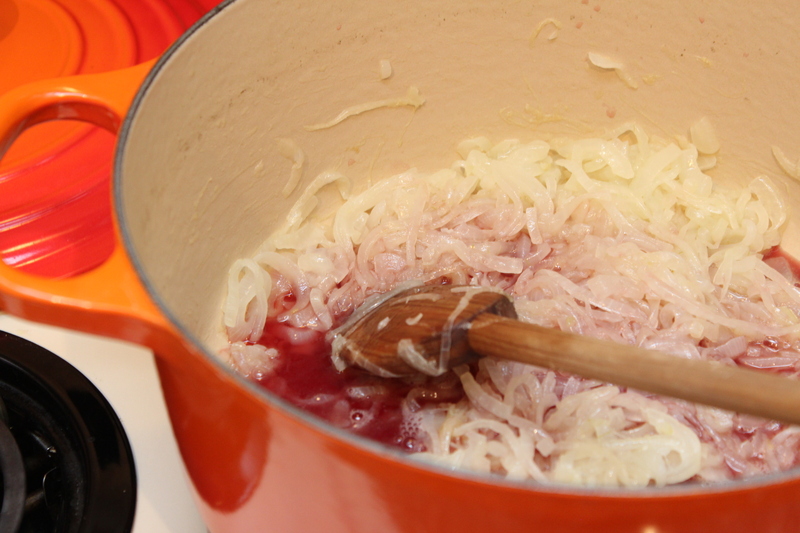 Add ½ the red wine and deglaze the pan, allowing all the liquid to cook off. Add the sugar, thyme, salt and pepper and cook for 5 more minutes. 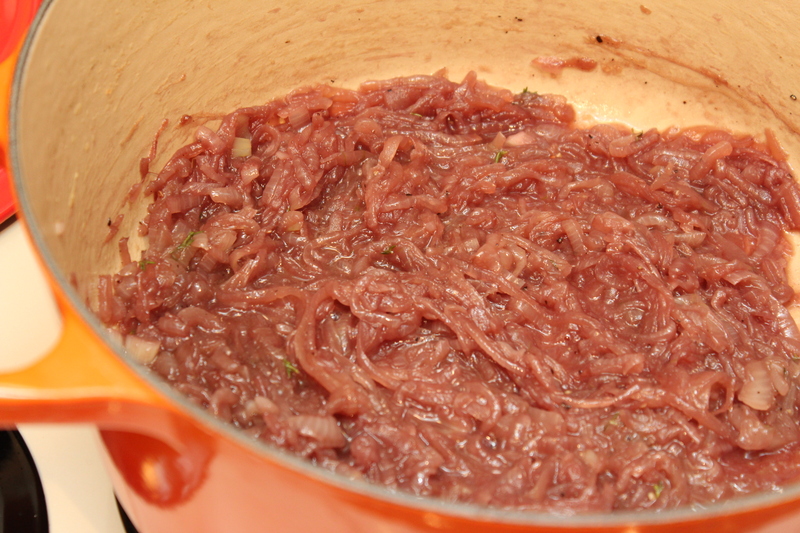 Add the remainder of the red wine and once again continue cooking and stirring until the liquid has cooked off. 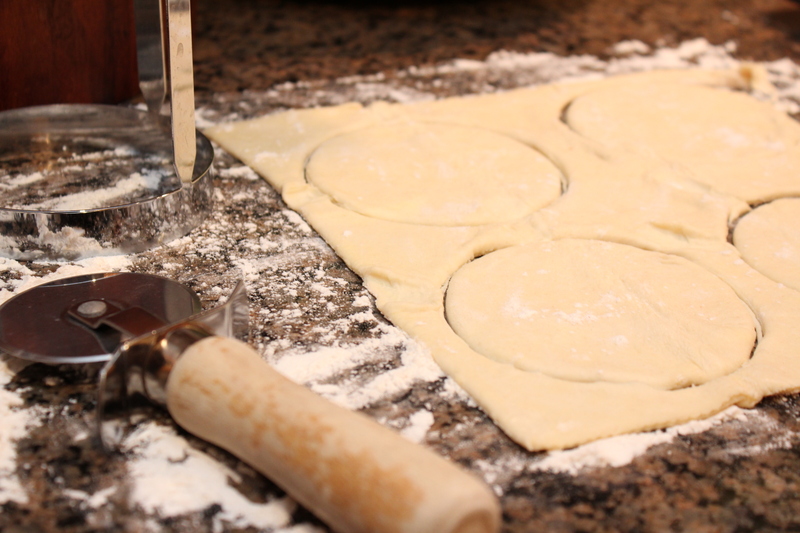 Place your puff pastry sheets on a floured surface and cut out the circles to desired size. You could also cut the pastry into 4 squares. This way you better optimize the pastry sheet with no wastage through offcuts. Score the inside of the pastry with a small cookie cutter or a knife, but don’t cut all the way through, to make a small rim. Brush the rim of each case lightly with milk, or and egg and milk mix (I find the egg just makes it a little darker but isn’t entirely necessary), and bake in a oven that has been preheated to 180C for 10 minutes. Remove from the oven and press down on the inner circle piece so that it drops down, it should come away where you have scored it, and fill each pastry case with the caramelized onion. Top with the goat cheese (you can either crumble this or cut into discs), scatter over fresh thyme leaves and return to the oven to bake for 20 more minutes.